For the decoration, break up the marzipan and knead it together with the confectioners' sugar, divide into 3 portions and color each portion pink, yellow and brown (using the cocoa powder for brown). Place the marzipan between two layers of plastic wrap, roll out and cut out Easter eggs shapes and branches. For the glaze mix the egg white with the confectioners' sugar. Put the glaze in a plastic sandwich bag and cut a tiny corner. Use the glaze to decorate the marzipan eggs with fine lines. 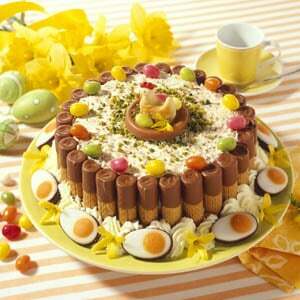 Sprinkle the cake generously with confectioners' sugar and decorate with the marzipan eggs and sugar flowers and leaves.